Whenever I need a little reminder that it can be done I go to this site and look for a little inspiration. 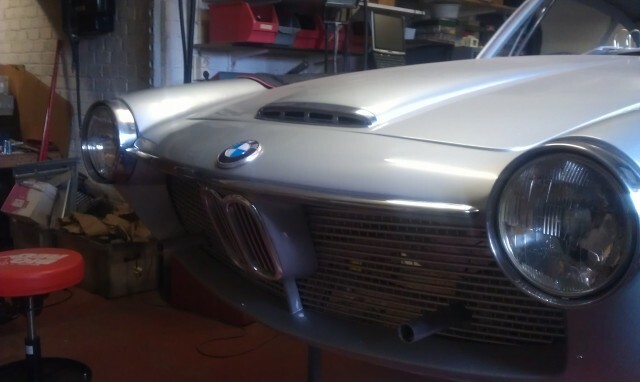 A BMW 1600GT rebuild in .be with little to no narration, but very eloquent pictures and elegant solutions. Especially helpful is the fact that I have a very similar car that I will be going through some of this stuff with in the near future. Don’t follow the link unless you have some time to spend looking over some good work. The Sprint Speciale of BMW’s? 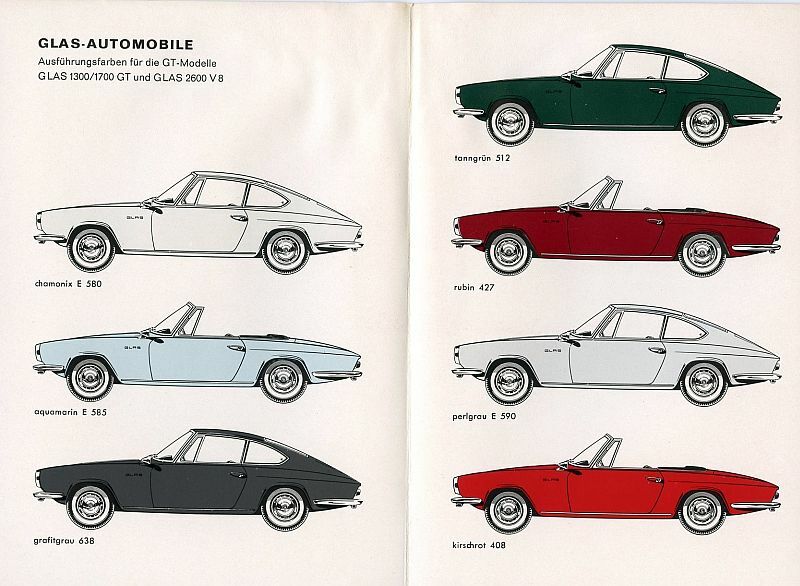 Well, Franco wasn’t involved and realistically it’s a badge engineered Glas GT making it a Frua, and therefore magically Italian, and numbers are low -but low enough to be serious money one day I can’t say. It’s really funny to think that I had plans to have this car run before Rufus was born, and here he is 6 weeks old already! Well, today I made a big step in the direction of it running -I went and fetched it from Sacramento! As soon as I saw it again the fire was stoked, and I’m hot to get it put together. 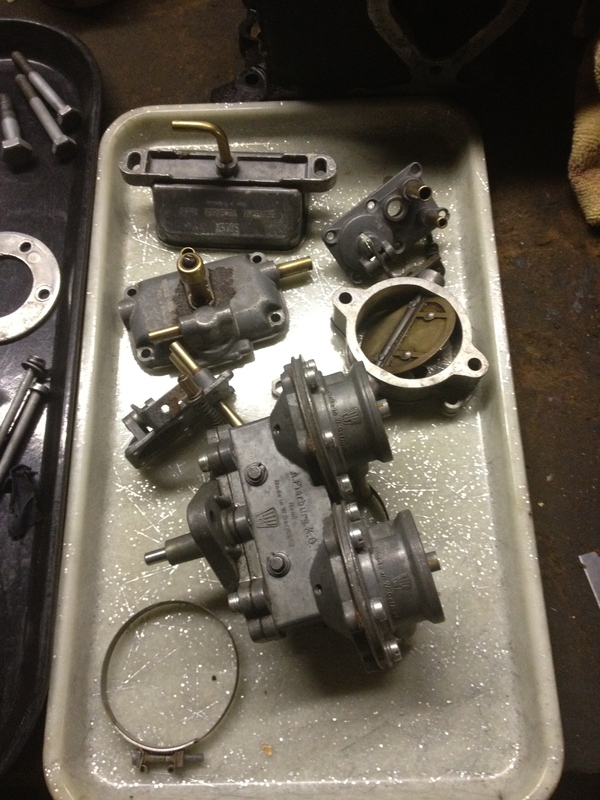 The bottom end of the engine, rebuilt head and all the other little parts I’ve cleaned up have been waiting for this. Time to get cracking! Freshly powder coated wheels look great. Tires are 175/70/14’s. Two of the rims had some scale rust around the valve stem hole that prevents the stem from sealing so I will be using inner tubes in those two wheels. Almost looks like a car from this side -being mostly red and all. Today was an exciting day, the head I dropped off at my local machine shop for a skim and valve job a few weeks ago turned up and progress on the build could begin again. I asked for the budget build -basically the minimum required to get me on the road, which turned out to be new stem seals, a quick pass with a fly cutter to skim the head and a nice valve seat cut. There’s corrosion around the water passageways and deposits on the exhaust valves, but the head is flat and the valves hold pressure, so it should work -would in Calcutta. 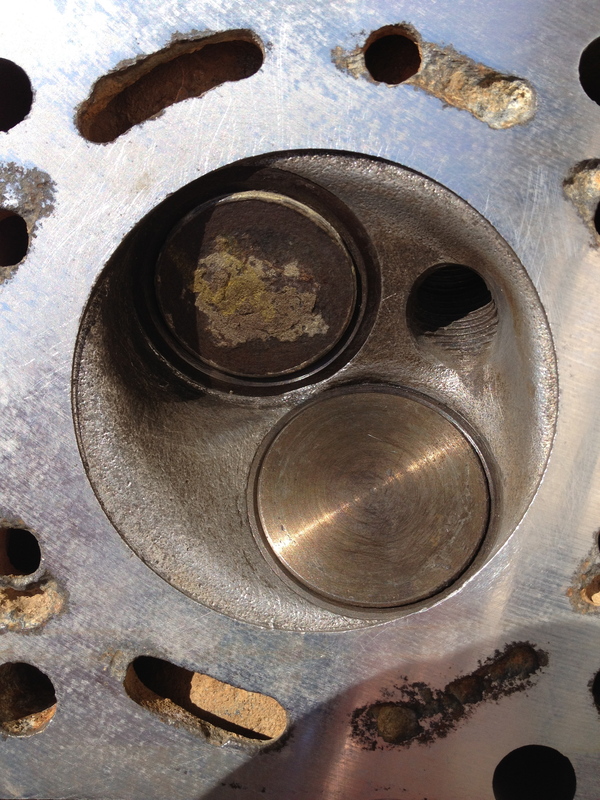 Check out the angle the spark plug comes in at. The day is getting close when I will have the Glas 1700 GT in a position where I can work on it, the whole thing -probably early next week. 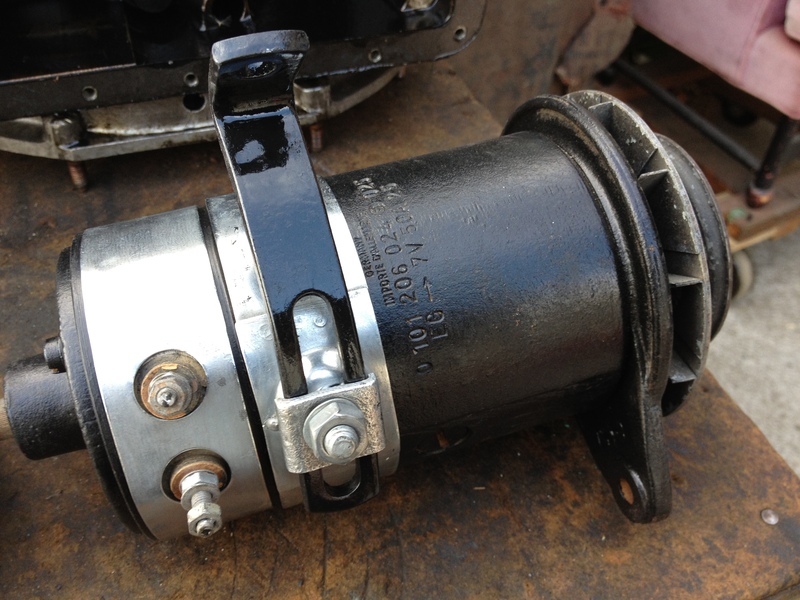 The plan was to have the parts I dragged home and those taken from the parts car ready to bolt on when it turned up. The plan is coming along -but I’m behind schedule -in part due to my getting sidetracked doing more than necessary to fix things up as evidenced by the generator below, and in part due to how long it takes to get parts from Germany. I did get the charging system together though! This is a Bosch 6 volt generator. I had 3 to choose from to clean up and this one was the cleanest, had best bearings and the best brushes. I suppose I’ll restore the other 2 at some point and have them ready for service -it may be a Bosch, but it is a generator after all, and in my experience they are tempermental. A car restoration can be looked at from a lot of perspectives -some with blind trust through a pen writing checks, some like a soccer coach all passionate on the sidelines cajoling the players, but for me it’s all a hands on, do it yourself deal involving my time, hands and some percentage of my processing power at any given time with the intended consequence of improving things and learning. That and the occasional trip to the powder-coaters. Intake parts here, the duplex fuel pump again, a good portion of the remote float bowl, one of the chokes, booth accelerator pump covers and a hose clamp. In this orientation and state, they are little more than intricately beautiful mechanical objects sitting near each other on a tray. Put them together with the rest of their coterie in a particular way and they precisely pump and meter fuel. 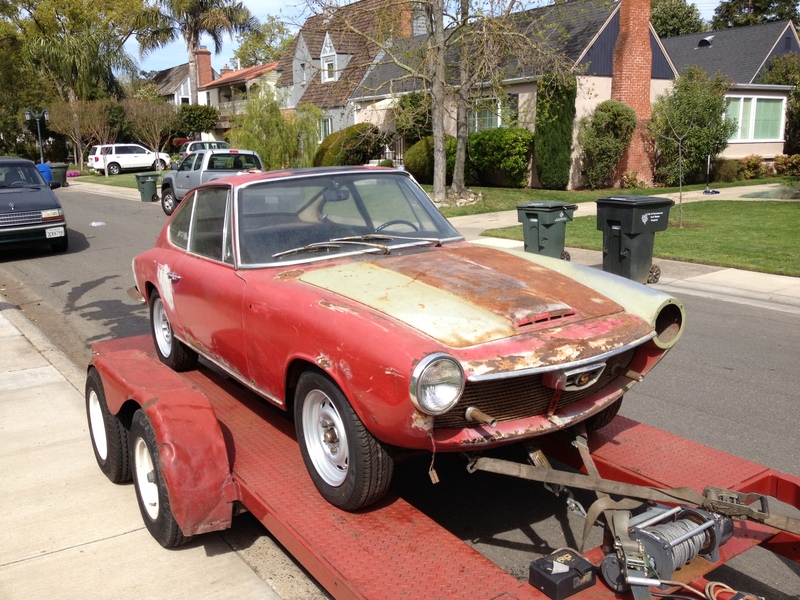 How do you plan for a classic car restoration project? Do you do research, make lists -parts to buy, tasks to accomplish, money to spend, craftsmen to talk to? Or do you dive in and start taking things apart because your money supply and knowledge are vast? When I was working on the Giulietta SS I sold last winter, I had short term lists, but no long term list. I didn’t have a budget to meter out money, and I didn’t have a clear path to success. With my Glas GT project I am trying to do as much up front planning as possible. Can’t have a post without an image right? 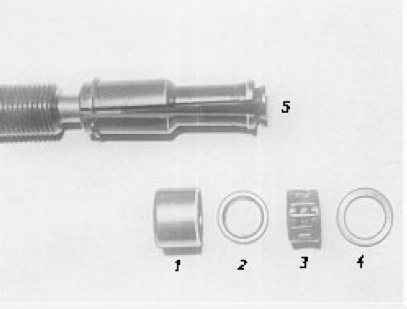 This is the pilot bearing assembly in the end of the crank shaft. It is indeed a little needle bearing. Anyone have one of these special tools I can borrow?